This interesting and unusual surname has two possible origins, the first of which is from the early medieval English metonymic occupational surname for a maker of boxes, chests or other wooden receptacles. 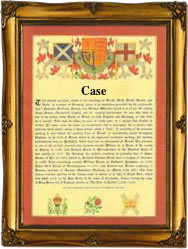 The name from this source derives from the Anglo-Norman French word "case, casse", case, container, from the Latin "capsa", a derivative of the verb "capere", to hold, contain. Job-descriptive surnames originally denoted the actual occupation of the namebearer, and later became hereditary. The first recording of the surname below, is from this source, and one Clais Casemaker is recorded in London in 1367. The second possible origin for the name is from a variant form of "Cass", a medieval female given name which was a short or pet, form of "Cassandra". This was the name of the Trojan prophetess of classical legends, doomed to foretell the future but never be believed; her story was very popular in medieval England. The marriage of John Case and Helene Gwharton was recorded at St. Stephen's, Coleman Street, London, on August 12th 1545. The first recorded spelling of the family name is shown to be that of William Case, which was dated 1274, in the "Hundred Rolls of Suffolk", during the reign of King Edward 1, known as "The Hammer of the Scots", 1272 - 1307. Surnames became necessary when governments introduced personal taxation. In England this was known as Poll Tax. Throughout the centuries, surnames in every country have continued to "develop" often leading to astonishing variants of the original spelling.